Located just 67-km north of Las Varas, San Blas Mexico on the Bay of Matanchén (Bahía de Matanchén) is the type of destination that is perfect for a weekend getaway with family and friends. San Blas is also just 42-km from Guayabitos and 147-km from Nuevo Vallarta. Along the seven kilometers (four miles) of fine sand beaches of Bahía de Matanchén you can enjoy impromptu soccer games, languid walks along the shore, or the thrill of riding the Pacific Coast waves on a surf board. Not far from San Blas Mexico and flanked by impressive palm trees and the green hills that border the crystal-clear waters, you’ll find Playa Las Islitas Nayarit. This secluded beach on Bahía de Matanchén is in a protected bay and renowned for some of the best surfing conditions ever. The formation of cliffs near the shores of San Blas Mexico is a popular place for adventurous visitors seeking that perfect memory photo. All along this beach you will find traditional thatched-roof huts serving up a variety of delicious traditional dishes such as freshly-prepared ocean fish and local seafood from the region. In Playa Las Islitas Nayarit and San Blas Mexico your tasty meal can even be accompanied by a refreshing drink and the notes of a traditional Mexican folk song. Dining here is truly a mouth-watering tradition that you mustn’t skip. And, on your way out of San Blas, be sure to visit some of the businesses lining the San Blas-Tepic Highway. Here you will find great products for sale such as banana bread, cocadas (coconut candy) and other traditional favorites from the region. “What say the Bells of San Blas/To the ships that southward pass/From the harbor of Mazatlan?/To them it is nothing more,” recites José Nicolás Quirarte, while he contemplates the scenery of the port of San Blas Mexico. He speaks the verses of this famous poem in Spanish and English from the hill on top of which we find the Contaduría. La Contaduría San Blas Mexico is one of the many buildings located in this important port where history continues to live on and flourish despite the passing of the years. “Here, we have a lot of stories,” affirms José, a proud 78- year old San Blas resident that has dedicated his life to sharing the history of San Blas Mexico with the many people who visit the port every day. Visiting San Blas is like stepping back in time; to a time when things moved much slower. Here, even simple daily activities such as strolling along the streets or drinking a cup of Mexican coffee take on a new dimension with a heightened sense of enjoyment. As you explore the streets of San Blas Mexico you will relive the events of years past that have marked the history not only of the state of Nayarit but of the entire country of Mexico. Be sure to book one of the San Blas hotels like Hotel Garza Canela or Hacienda Flamingos and plan to stay awhile. In this town, time seems to progress at a different pace, almost standing still with its haciendas, historic buildings, and quiet streets – down which residents ride bicycles they have modified in the most curious of ways. This is, of course, complemented by the impressive natural wonders that abound in San Blas Mexico that offer plenty of activities for the adventurous. 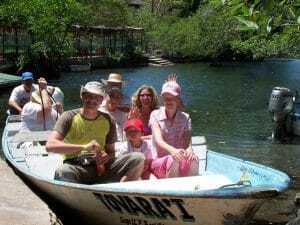 Come discover the navigable canals surrounded by mangroves, the small islands, and the annual arrival of more than 300 migratory birds (perfect for bird watching), which makes this one of the best Nayarit destinations. San Blas is a must-see, unforgettable paradise. The origins of San Blas Mexico date back to the late seventeenth century, a time when the port was constructed as a shipyard and point of departure for the colonization expeditions of the Spanish Crown. This town was founded by Nuño Beltrán de Guzmán in 1530, although King Charles III of Spain did not recognize it as a deep sea port until 1768. This was the same year that Franciscan friars led by Friar Junípero Serra headed out of San Blas towards the Nuestra Señora de Loreto Mission on a quest to colonize the Californias. In San Blas Mexico, the first maritime customs house on the Pacific was established, and the town became the most important of the region during the Colonial period. Be sure to visit the historic buildings of the port to learn the history of San Blas first hand through the stories of its chroniclers, people, and architecture; silent witnesses to the events of the past. 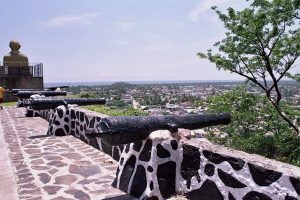 Your tour can begin in the Contaduría, a stronghold constructed in 1770 atop the San Basilio Hill, and where the accounting offices of the colonial hacienda were established. 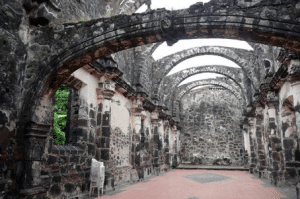 Just a few steps down the hill are the ruins of the Nuestra Señora del Rosario Temple, constructed in 1769. Here, you will feel as if you have stepped into a scene from a period film. You will soon begin to imagine how life must have been for the first faithful followers who lived the splendor of San Blas Mexico in the early centuries. The building, near the pier where the Culture House currently stands, was once the Former Maritime Customs House, erected in the nineteenth century to control the traffic of merchandise that came through the port. San Blas Mexico also played an important role in the war for Mexico’s Independence. The essential involvement of the Port of San Blas Mexico can be seen in a sculpture located high up in the Contaduría of priest don José María Mercado. He was an insurgent that fought to defend the freedoms of Mexicans, a fight that would eventually take his life. Also earning a place in history is the Battalion of San Blas Mexico, which honorably defended the capital of Mexico in 1897 from North American invasion. 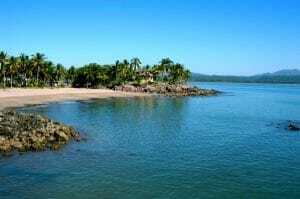 Planning a vacation in San Blas on the Pacific Coast of Riviera Nayarit? Visit our Nayarit hotels page to check out accommodations. A visit to this historic gem on the Pacific Coast of Mexico wouldn’t be complete without a visit to the San Blas beaches. El Borrego, whose fine golden sands stretch for three kilometers (two miles), is one of the most frequented destinations among lovers of big waves. And after a quick boat ride, you can explore the wonders of Isla del Rey, a paradise of natural beauty where you can not only bask in the Pacific Ocean and relax on the sand, but also sample some of culinary delights of San Blas Mexico. Also essential is a visit to the Piedra Blanca, a small rock formation off the coast of San Blas Mexico where the image of the Nuestra Señora del Rosario Virgin —also known as La Marinera— is found. This virgin is the patron saint of sailors, and San Blas residents pay homage to her every year on October 7. The Piedra Blanca is also an important ceremonial center for the native Huichol people. The area around San Blas Mexico offers plenty of activities and attractions! Natural wonders of area around the Port of San Blas Mexico include a tropical marsh that includes the El Pozo estuary, the La Tovara National Park, and the San Cristóbal River. La Tovara National Park is located two kilometers (1.2 miles) from San Blas Mexico and is one of the region’s most impressive natural attractions. Here, you will have the opportunity to explore by boat and appreciate a beautiful variety of mangroves, home to turtles and birds such as boat-billed herons and white herons. You can also appreciate first hand the floating wood homes, occupied by some of the first settlers. These houses were recreated for the filming of the movie Cabeza de Vaca. Farther down the San Cristóbal River is a community crocodile sanctuary where you can admire reptiles and a variety of animal species, as well as take part in important wildlife research and protection efforts. To round out this unforgettable experience, head over to Isla Isabel —located 70 kilometers (43 miles) from the Port of San Blas Mexico. Isla Isabel is a natural rock formation of volcanic origins and home to a wide variety of birds. 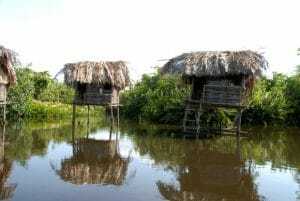 Another great option is to visit the Cora community of Singayta (located just two kilometers [1.2 miles] from San Blas Mexico) and delve into this interesting culture. Your trip to San Blas Mexico, just like the essence of this Mexican port, will be truly remarkable.